The holidays are over and snow throughout Iowa will soon begin to thaw as we make our way towards Spring. This has many of us thinking about landscaping, the joy of kicking kids outside without worrying about frostbite, and of course – home maintenance. Spring is a great time for upgrades and modifications that personalize your home. It’s also a great time to care for the exterior siding that makes your home look great while protecting it from the unpredictable Iowa weather. For most people their home is their biggest investment. 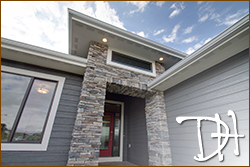 Fortunately, the experienced team at Drake Homes understands the importance of building with high-quality siding products that maximize durability and keep your home looking beautiful. Although different siding products features a wide variety of characteristics, all lap siding (which is the most common in the Midwest) shares very similar maintenance requirements. Here are 5 easy siding maintenance habits that will extend the exterior life and beauty of your home. Over time, dirt can build up and begin to damage the exterior of your home. Fortunately, this is easy to avoid. The best way to give your home an annual bath is simple. Grab a sponge or soft brush and a bucket filled with water and mild detergent. Simply wipe the dirty surfaces and rinse with water from a garden hose. It's that easy! Avoid using a power washer as the high-pressure water can cause damage to the surface of the siding. There's also no need to risk using harsh abrasives or solvents. They can also damage the surface of the siding or even strip your exterior paint. With frosty cold winters and steamy hot summers, the paint coatings on your siding may develop small imperfections. It’s important to care for these areas with matching paint by using a cotton swab and touching up damaged areas as soon as possible. 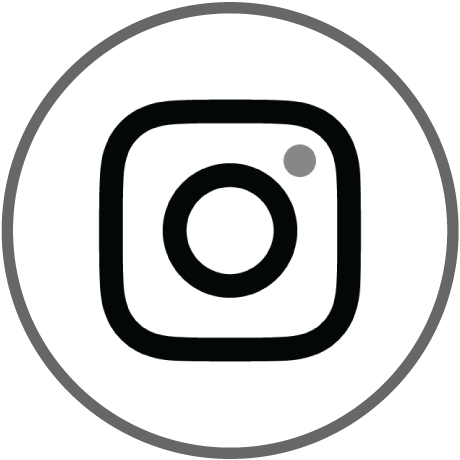 Even with a the same paint, the sheen may not provide a perfect match, so catching small imperfections early will reduce the area where new paint is applied and not draw any unwanted attention. It’s important to make sure water is not pooling against the siding or foundation of your home. Make sure irrigation sprinklers are not aimed toward the house and that your gutters are clear to avoid unwanted water problems. 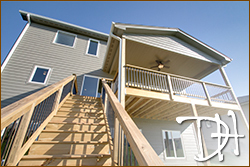 Mold or mildew can form on your home siding when one side of the home is always shaded. It can develop on top of the siding, creating discoloring and the potential for other issues. This can be quickly resolved with a solution of three parts water and one part white vinegar. Although the technology and quality of sealants has improved drastically over the past decade, it is still important to inspect the sealant on your home every year. As with paint touch ups, it is important to tackle any issue while it's still small and then carefully match the color of new and existing sealant to ensure a uniform look. Are you building a new home? Perhaps you're an existing homeowner looking at replacing your siding? I hope this quick list of siding maintenance ideas was helpful, but know there's an entire library of LP Smartside Resources you're sure to enjoy. 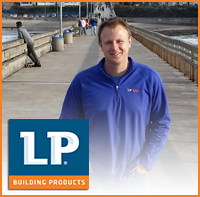 Brett Molden is the Market Development Manager for LP Smartside Trim & Siding. He is a Des Moines native and has worked in construction for 15 years. Along with long-lasting trim and siding, LP Building Products partners with Drake Homes to provide home framing products, home paneling products and many more high quality building materials. 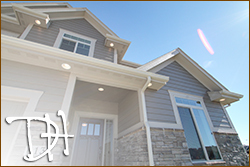 Brett and his LP Innovation team is proud to supply LP Building Products for the beautiful, energy efficient and highly durable new homes built throughout Des Moines.